This is my version of The Boiling Crab's The Whole Sha-Bang Sauce. Let me make it clear that this is not The Boiling Crab's exact recipe. I might have missed or added some ingredients, but I must tell you that this tastes so close to the original! 1. In a pan over medium heat, mix all ingredients except shrimp, potatoes, sliced lemon and garlic. When adding the cayenne and chili powder, start with about ½ Tbsp each first. Simmer until all ingredients are incorporated. Do a taste test as you simmer. Adjust the amount of cayenne and chili powder according to your liking. Add potatoes and simmer while stirring for about 10 minutes or until potatoes are cooked. 2. Once potatoes are cooked, add shrimps and stir for 3 minutes or until they are cooked. Turn off heat then add garlic and sliced lemon. Mix until well combined with other ingredients. Cover for 5 minutes before serving. Note: You can also precook the shrimps and potatoes and just toss them into the sauce. But if you want the flavor of the sauce to be fully absorbed by the shrimps and potatoes, the above cooking method is advisable. Thank you for sharing. We have a Boiling Crab near us but I haven't visited yet. I might not need to! I can try your recipe instead. Thank you for sharing. With butter and spices, this will be taste amazing Tina. Love this shrimp recipe, it is always best than any restaurant I can say that 100%. 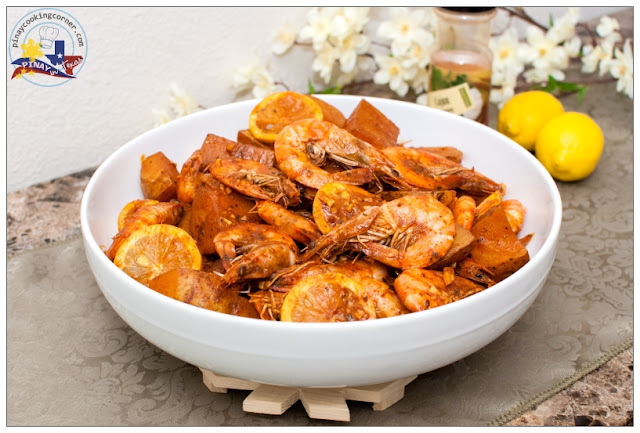 We all love shrimps at home and this is a totally delectable way of cooking them! Amazingly good! 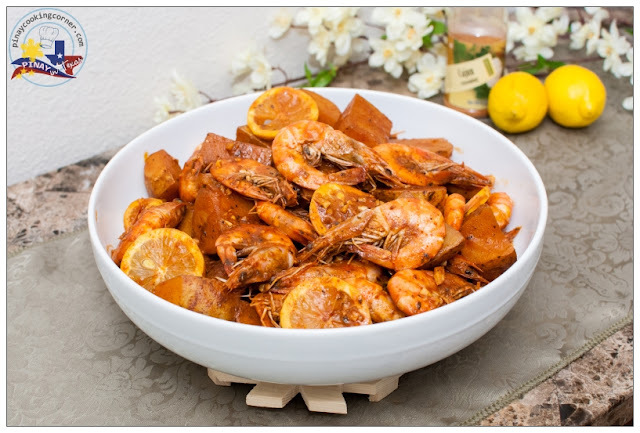 Lipsmacking good shrimp recipe Tina. Butter and spices with shirmps........wow..total droolworthy. I've never been to the Boiling Crab, but I'm glad you've introduced me to this marvelou shrimp dish! It looks amazing! I do agree with you, Tina. Sometimes restaurants can be a rip off. We only eat in restaurants where the food is always good and the price is reasonable. The shrimps look fab and even it is not exactly as it is in the restaurant, it definitely looks delicious. It looks delicious and I totally agree with you: why go out to eat low quality food and/or expensive? I could add here also bad waiters... We go out less and less and have restricted our meals out to exceptional places. 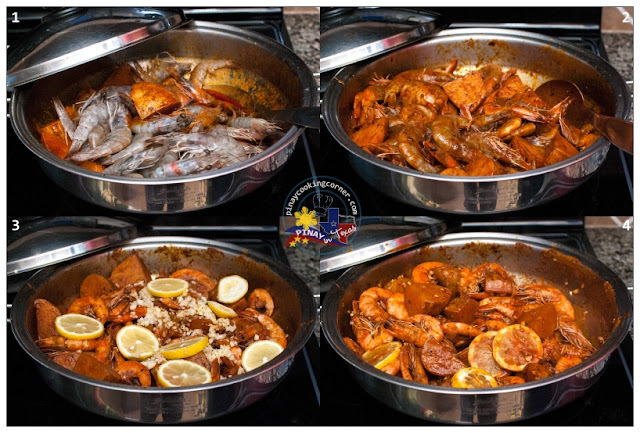 Yes, we love Boiling Crab, but never tried to make it at home...yours look great...I must give this a try sometime soon. Yum! First look at these and i felt like tucking in them right away!! Every bit about this dish is so delicious. Hi Tina, this prawn dish look absolutely delicious. very inviting, guess I need extra rice to go with this.. Thanks for sharing the recipe. Have a nice day. Eating out is for sure expensive. There so I would love to try this stunning shrimp recipe, lovely flavors for a awesome taste on my taste buds. I was craving Boiling Crab all week and finally got a chance to make it today. Oh My Goodness I took one bite and I could not believe how much it tasted like Boiling Crab. This recipe is a keeper!! We moved here from Los Angeles and lived 10 minutes from our local Boiling Crab. I only agreed to relocate when I found out there was one in the Dallas area. That location is small and always crowded. I can't wait to try this recipe. I made this today and it was excellent. Thank you for the ingredients. Boiling crab here is always crowded, about 1.5-2hrs wait time. Hello :) I noticed you listed 1 stick of butter and I see in your picture you use 3 .. Is this because of a greater serving size you are using? Thanks for the recipe! I tried making this tonight with just shrimp. It was tasty, although I will make a few adjustments per my own preference in the future. I might use less or omit the Worcestershire, lemon juice and oregano in the sauce. I found the amount of those ingredients I put in the sauce was overwhelming and I can always add the lemon at the end. But the recipe was tasty nonetheless.